Americarpet: Should You Buy New Carpet Or Have Your Old Carpet Cleaned? Should You Buy New Carpet Or Have Your Old Carpet Cleaned? There are carpets that are built to last as little as three years and some that can last upwards 30 years. Sooner or later, though, your carpet will have outlived its days and will need to be replaced. Below you'll find a quick guide to help you figure out if your old carpet is still deserving of another professional cleaning or if it is time to buy a new carpet. 1. Is your carpet matted down? One of the first signs of "carpet death" is when the pile starts to flatten or mat down in the main walkways and stairs. If your carpet is made of PET Polyester or Polyester and is matting down, then your carpet is most likely on its way out the door. Polyester fibers are not very resilient therefore are known for crushing and matting down. The tuft will not ever return to its original upright position once it falls over and lays down. Having your carpet professionally cleaned in this situation will not likely give your carpet any renewed life. However, if your carpet is made from nylon or sorona, you may be able to remedy the problem with a professional cleaning. Nylon is well known as the most resilient fiber because after being cleaned it has the ability to regain its like-new appearance. Sorona, also known as Smartstrand, PTT, or Triexta can regain some of its like-new appearance after a thorough cleaning and is more resilient than polyester. 2. Do you have a looped Berber carpet? If you have a looped Berber carpet made from Olefin, and the once upright loops are now laying down flat, then it’s likely that your old carpet has seen better days. Though Olefin is a very durable fiber, it's not very resilient and therefore prone to matting. Olefin is inherently oily by nature and is cheap to manufacture. It is harder to keep clean because it tends to attract dirt easier. Homeowners usually report that stains or oily spots reappear soon after being cleaned. If your Berber carpet is made from Olefin and is matted down, looking dingy, and is more than three years old, spending money on professional cleaning will most likely not yield beneficial results. It is probably a good time to consider replacing your carpet. Berber styles made from nylon are much more desirable because they are stain resistant, resist matting, and in general have a much longer lifespan. Though, when compared to Olefin, nylon typically runs much higher in costs . You can expect to pay $20-$40 per yard for a good quality nylon Berber carpet. If your Berber carpet is 10 years old or less and is made from nylon, then a professional cleaning can easily rejuvenate your carpet and give you many more years of service. 3. Is your Carpet Permanently Stained? No carpet is 100% stain-proof even expensive carpets can be ruined by staining. Most carpets sold today have some form of anti-stain treatment either infused or applied. Anti-stain treatments that are topically applied can wear off over time or simply wash off completely. Scotchgard is a well known anti-stain treatment product that is topically applied and can be reapplied as necessary. Most carpet cleaning companies provide this service for a nominal fee. If you do not want to fuss with carpet treatments, Stainmaster works very efficiently. Stainmaster carpets have an anti-stain system that is infused into the fiber and does not wash or wear off. 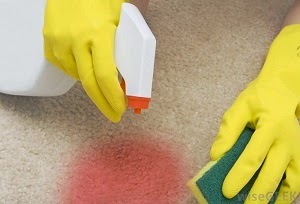 Professional carpet cleaners can remove most household stains. Unfortunately in some cases there is little hope. Carpet manufacturers have a list of certain types of stains that are not covered under their warranty including mustard, teas, bleaches, acne medications, plant fertilizers, drain cleaners, and plant food- to name a few. If your carpet has permanent stains or damage caused by feces, vomit, urine, mildew, mold, or other biological substances then your carpet may be a health hazard and should be replaced. Consult with a professional carpet cleaner if you need an expert opinion or advice. 4. Is your Carpet more than 10 years old? Most carpet and padding sold today are designed to last roughly 10 years. This is considered to be a medium grade or quality level that most homeowners select. 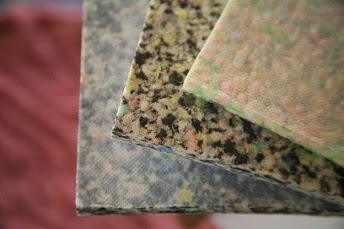 Prices range from $20 to $35 per square yard installed with a rebond pad. If your current carpet is more than 10 years old and you have issues like wrinkles or ripples, fading or color loss, crushing or matting of the pile, or a lack of padding support in halls, main walkways and on stairs, then your carpet and padding may be at the end of its intended lifespan. Keep in mind, spending hundreds having your carpet professionally cleaned won’t make a worn out carpet or padding come back to life. 5. Is Your Padding Worn Out?